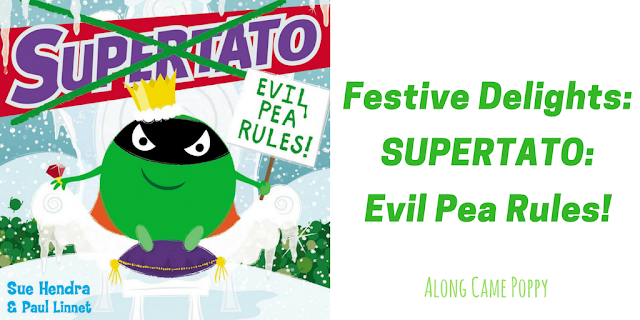 Along Came Poppy: Festive Delights: Supertato: Evil Pea Rules! Festive Delights: Supertato: Evil Pea Rules! After a little break from reviewing, we are back and ready to tackle some festive delights. 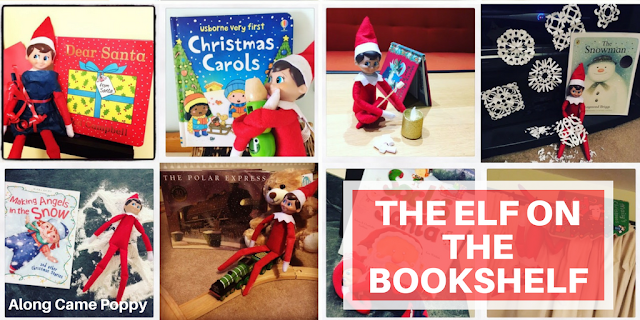 Throughout 2016 we read a different book each day and during Advent the books were chosen by our cheeky elf on the bookshelf, Elvis. If you missed it, you can read all about Elvis' excellent choices and the chaos he caused here: The Elf on the Bookshelf. Well this year Elvis will be back, just don't tell the Mini Reviewers yet, and we will be reading a different book each day in the run up to Christmas. However, we thought we would be extremely kind and give you a sneak peek of the 25 books we will be reading in advance just in case any of them take your fancy! So throughout the remainder of October and all of November keep an eye out for our "Festive Delights" posts. 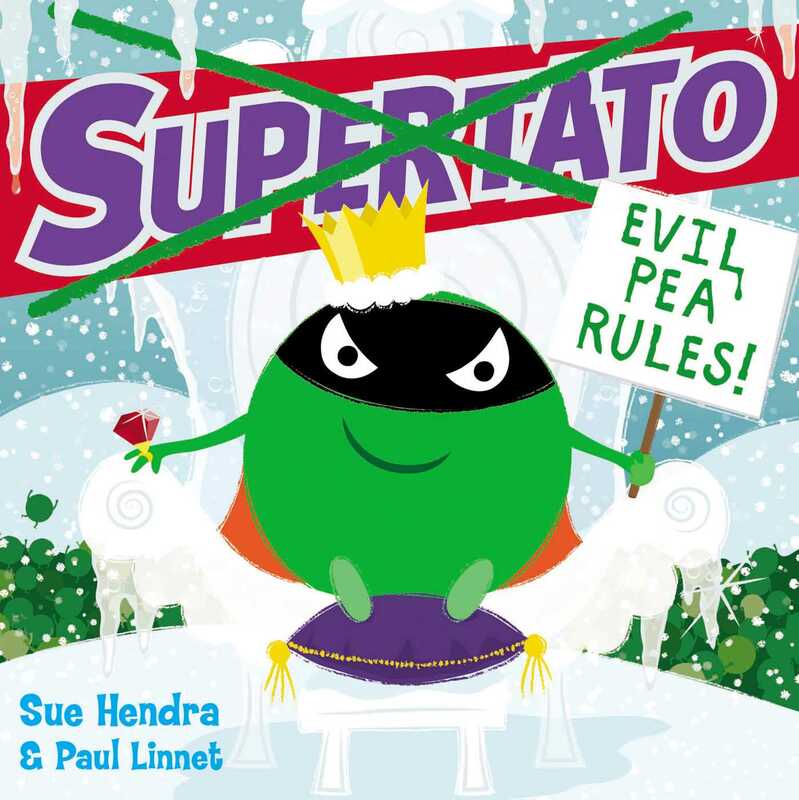 Our first Festive Delight for 2017 is the latest book in the Supertato series by Sue Hendra and Paul Linnet. Now the Mini Reviewers are MASSIVE Supertato fans and so "Supertato: Evil Pea Rules!" was always going to appear in our Christmas selection. In this story Evil Pea has escaped yet again and this time he is set on turning the supermarket into an icy kingdom for him to rule over. However, the veggies have other ideas and they start to enjoy their supermarket snow day! Meanwhile Supertato, who has been detained by Evil Pea, manages to create a festive disguise using supplies from the supermarket but will his clever plan be enough to deal with Evil Pea once and for all? Well that would be telling! All we will say is that this is an exciting story with a real festive vibe, and as Izzie (5) put it, "it's super cool!" So definitely a must for every Supertato fan's stocking this Christmas! *Disclaimer: We received a copy of Supertato Evil Pea Rules! from the publisher via Toppsta for review purposes. This post contains affiliate links, you can find out more here. They are brilliant so I can understand that! I can't wait to read Harry Potter with my lot!